De Kattenkabinet or the Cat Cabinet is a small museum located in the patrician house and was founded in 1990 by William Meijer who was a very wealthy Dutchman in the region. The museum specializes in art representing cats and sees a lot of tourists all year round. Sculptures, paintings, posters and books are all available in the destination and yes, they are all about cats. So if you are someone who loves felines then wait no longer. Take a tram from Amsterdam, Koningsplein. 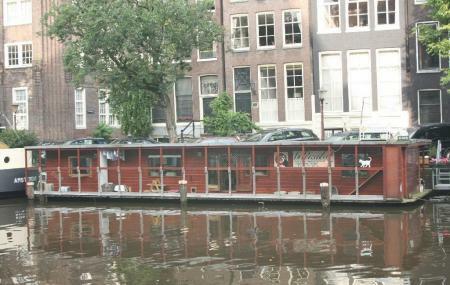 People normally club together Amsterdam Canals and Hermitage Amsterdam while planning their visit to Kattenkabinet. Very cute! Even has a Picasso and a Rembrandt! Go if you like cats; there are real cats there but I only met one. Well-stocked gift shop and lots of not so famous but good art there. I loved it even though I am not super cat-oriented. Super quirky museum - really fun. The place isn't massive but theres so much packed into it. There were even 2 cats roaming around causing as much chaos as they could - the perfect cat museum. Priced very fairly- €7 for adults entry. Worth a look if you're in Amsterdam and love cats! Has a lot of untouched potential. It was surprising to find art pieces from grand names like Picasso and Rembrandt, and a piece from the Cats musical. However, it is a rather small museum, and it seems like there are rooms not being utilized for the museums purpose? This might be why the price is very good, but I cannot help but feel like more could be done. It is a perfect place for a cafe! Also surprised by the gift shop, which did not have as many novel pieces as hoped. Feels like more could be done here. It was nice to see the cats, when they felt like it! This is a small museum that will make you very happy if you like cats. There are posters, statues, paintings etc. of and with cats and there are also three (?) real cats roaming around. The back yard is really beautiful and quiet! A lovely place to visit.